Smaller Samsung Galaxy Notes on their way? 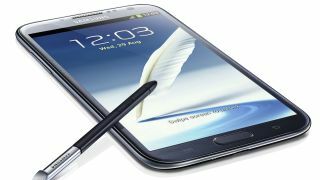 The Samsung Galaxy Note line-up will continue to grow and may contain cheaper models, TechRadar was told. "The Galaxy Note 2 with a 5.5-inch screen is our smarpthone offering in the Note category, the ultimate balance between portability and uncompromised media selection. "But [the Note] is an important category for us, and you'll see us investing in and growing that area." The notion of a budget Note is an intriguing one, as most of Samsung's messaging is around the power, creativity and productivity on offer with the Note 2 and Note 10.1 – which it would struggle to maintain if it offered a lower-spec model. But with the company seeing Note as a strong category to go alongside its S-series of smartphones, the notion of a cheaper option that still uses the stylus would be attractive to consumers looking to get their hands on something different from the faceless black slabs on offer at the moment.